This is a portal fantasy like you've never seen before. Gert has always dreamed of being whisked away to Fairyland, but when her dream finally comes true, it is nothing like what she expected. Gert is sent on a quest to find the magical key to get her home, and 27 years later, she's still looking for that key. And while Gert appears to still be a 10 year old girl, she's actually aged thru those 27 years, and those years have not been kind to her. And she hasn't been kind to Fairyland. Skottie Young completely turns the portal fantasy on its head, creating a subversive fantasy that is unlike any other portal fantasy that I've read before. 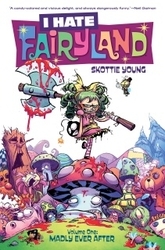 I Hate Fairyland is laugh-out-loud funny, beautifully violent, and filled to brimming with Young's absurdly stunning visuals. This is a series that I'll be sure to keep following.